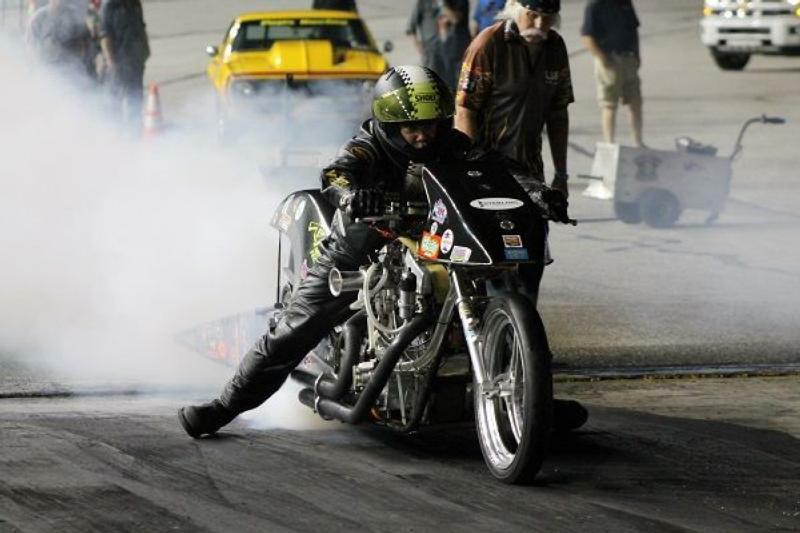 The fastest two wheels to ever challenge the pit lane drag strip showed their muscle on Friday Night at Atlanta Motor Speedway. Kirby Apathy and Preston Bartlett battled twice for track supremacy over the eighth-mile pit lane drag strip at the O'Reilly Auto Parts Friday Night Drags. "This is the fastest pro fuel bike in the world," said Apathy. "It's the only one to ever go in the sixes. It's gone 4.30 at 167 miles an hour over an eighth mile track." Despite owning the quarter-mile world record with an 6.85 second run, Apathy couldn't get the bike tuned in to beat Bartlett in either pass down the strip. Both drivers backed down the power as they got a feel for the track on the first pass of the night. "I just wanted to make sure I wasn't going to get in trouble because these things can get you in trouble a lot quicker than you can get yourself out of trouble," explained Apathy. Bartlett had Apathy's number again and ripped down the track on the second pass to set a new track record for two wheeled vehicles. "It's an adrenaline rush," explained Bartlett on whizzing down the strip at breakneck speed. "Everyone asks me and I say 'I get on, take a deep breath, close my eyes, count to seven, open them up and see where I'm at'." While the nitro bikes battled for track records, drivers in 18 different divisions looked to secure important points in a battle for a division championship. Tied at the top of the points standings entering Friday's action in the Super Pro Division, Robert Cheney of Jonesboro and his 2014 American Dragster inched ahead of the 2007 Chevy Camaro of Mike Chambers of Griffin for the division lead. Cheney advanced to the final round before falling to Arnie Cobb of Locust Grove and his 1974 Chevrolet Nova in the final race of the night. "I cut a pretty good light and luckily we hooked up an extra little boost button on it," said Cobb following his win. "Robert [Cheney] had me out of the hole. He was going to beat me, but I grabbed ahold of the button and everything in the electronics worked and she went on a ride." Cobb stays within striking distance of a division championship with the final round win as he picked up a point on the leader Cheney and is now five points back of the top spot in the division. Other notable winners included Mike Moore of Newnan and his 2017 COPO Camaro in the Harbin's Mechanical Services Street Outlaw Division. Moore stays in the Championship hunt with the final round victory over Wayne Harris of Griffin. Harris holds a two point lead over Moore and Daniel Harris of Griffin for the top spot. In the Diamond Resorts Factory Street division, Michael Hartley of McDonough, behind the wheel of his 1987 Ford Mustang, earned the final round win as he defeated the 2014 Ford Mustang of Nick Nicholson to keep pace in the battle for a division championship. Atlanta Motor Speedway's O'Reilly Auto Parts Friday Night Drags & Show-N-Shine returns to the pit lane drag strip next Friday, Aug. 17 for the penultimate race of the season as drivers in 18 different divisions take on the Pit Lane Drag Strip. Grandstand gates open at 6:30 p.m., and nightly drag race eliminations start just after 9:00 p.m.